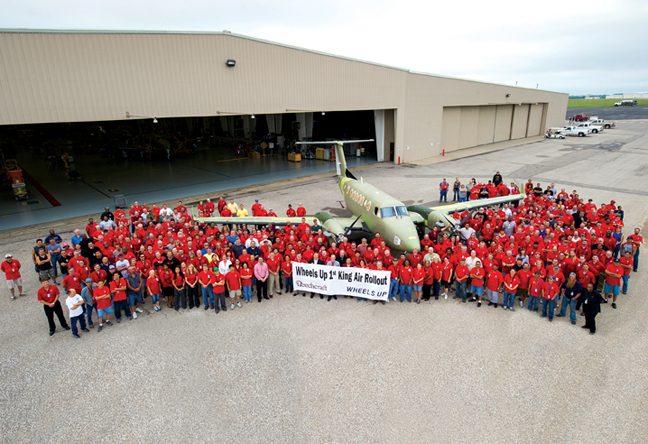 Beechcraft’s factory in Wichita has completed initial build of the first of 105 King Air 350is ordered by private aviation club Wheels Up. Private aviation club Wheels Up has appointed a management team packed with business aviation pedigree. Last month’s announcement of 15 high-level appointments came as Beechcraft completed the initial build of the first of 105 King Air 350i aircraft that Wheels Up ordered in July. Wheels Up CEO Kenny Dichter has tapped aircraft management and charter provider Executive Jet Management (EJM) and the wider NetJets group for the backbone of his management team. He has also turned to former colleagues from his jet-card company, Marquis Jet, including CFO Carl Thorsberg. Wheels Up’s co-founder and president is David Baxt from investment group Jefferies International, which helped source launch capital for the company. EJM president Robert Garrymore has been recruited to be the start-up company’s president for ventures. Serving alongside him as executive v-p for ventures is Ronald Silverman, who was EJM’s senior v-p of aircraft management, sales and owner services. From Bombardier Business Aircraft, Wheels Up has recruited marketing vice president Rod Williams to serve as its chief marketing officer and president of Wheels Up Canada. The company has appointed David Kaufman as its COO. Most recently he served as president of Tourgolf (a company he co-founded) and before that he was COO of national restaurant chain Cosi (another company he co-founded). Also drawn from the NetJets group are executive v-p for flight operations Rob Patris, who was v-p for owner services with the fractional ownership provider, and executive v-p for events Gary Spitalnik, who held similar positions with NetJets and, previously, with Marquis Jet. Wheels Up is also offering members a lifestyle concierge service called Wheels Down, through which they will have access to exclusive offerings around major sporting and cultural events. Another key contributor to this will be executive v-p for partnerships Justin Walker, who has been head of partnerships and business development at luxury destination club Inspirato, having previously held similar roles with Visa. Terrence Truta is joining Wheels Up as chief technology officer, having previously held the same position with Marquis Jet. Robert Withers, who was Marquis’s v-p for sports marketing, will be executive v-p for sales with the new venture. On the operations side of the business, Wheels Up has appointed Dave Hewitt as executive v-p for safety based on his 30 years of experience with Part 135 operators. Craig Blumenthal is joining the new company as executive v-p for special projects. He is an FAA-certified air transport pilot with more than 16,000 flight hours and most recently has served as director of aviation programs for Discovery Land. Also appointed as executive vice presidents with Wheels Up are David Blechman, who comes from the equities trading desk of investment group Cantor Fitzgerald; and Todd Olson, a private investor and entrepreneur with experience in real estate, commodities, healthcare, personal products, technology and film. Shoshana Dichter, previously senior v-p with Maury Rogoff Public Relations, is the company’s senior v-p for communications. Wheels Up is due to take delivery of the first King Air 350i during the fourth quarter, with the remainder of the turboprop twins slated to enter service between then and 2018. The company is evaluating prospective operating partners and will select one AOC holder to manage the fleet across seven or eight regional clusters around the U.S. It has yet to announce pricing or terms and conditions for members. As of press time, NetJets had yet to announce replacements for Garrymore and Silverman. The company did not comment on their departures from EJM.